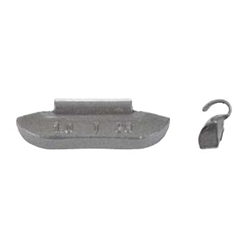 TN Type Lead Clip-on Wheel Weight Coated 2-1/2 oz BOWES WW TN250 Box of 25. The TN-Series lead clip-on wheel weight is used primarily on most domestic light-trucks equipped with decorative and larger-thickness steel wheels and most late-model light-trucks equipped with alloy wheels. Please refer to Application Guide (Part # 18082) and use rim gauge (RGP1) to verify specific applications.